I'm sharing my SVBAQ block for the mid month link up. Please visit the blog HERE and Facebook page HERE to see many amazing blocks in all kinds of sizes and fabrics. You can still join us - we have several months to go - lots of sharing on inspiration. Peonies are one of my favorite flowers. I am planning a large bed of them in the new garden beds this spring. They take a while to establish - but are worth the wait. We took a break from the unpacking and made a road trip to Iowa. It was short notice and I didn't coordinate any meet ups this time. Next time - for sure. 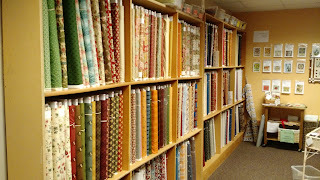 Along the way we stopped at Reproductions Fabrics. This is the image that graces the door. Once inside the shop it is just as you might imagine - walls of reproductions fabrics arranged by era. 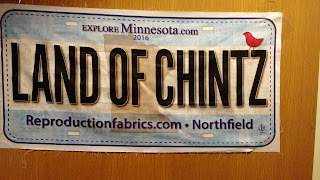 I made it just before closing and they were very generous accommodating my timing and stayed a little late to cut fabric. THANK YOU! I had a specific project in mind and of course found just what I needed - and more! We stayed a couple nights in Des Moines - and made some short road trips from there. A fresh snow made revisiting old favorites special, as we hadn't seen them dusted in snow. Do you know about the bridges of Madison County? HERE. Of course we had to visit the Iowa Quilt Museum. The current exhibit offered a wonderful assortment of star themed quilts. We enjoyed each and were unable to vote for a favorite - they were all too wonderful to select just one. This display case featured additional quilts. On the home front - I am still getting organized from unpacking. I feel so fortunate! Doniene and I shared some fabric a while back and look what she surprised me with - Just like it was made for the space. I have since added a Christmas pillow, rolled quilt and Santa to this space right inside the front door. She quilted it, and does beautiful work! Thank you friend!! I also have the guest rooms settled in, enough so that the kids have stayed over a few nights. Window coverings are still TBD so I won't show you my temporary paper window covers. This little arrangement in one of the three guest rooms. This is an extra night stand with a little glass door cabinet on top. the first nails in the walls. For now, I think they are cute folded under glass. Happy December - I hope you are finding some time to relax and stitch. The move went well - Thank you Allied Van Lines for a great crew! Unpacking and assembling is well underway. The important things are done - we can comfortably eat and sleep in our new home. The kitchen was priority one, as we are hosting a feast! I even tested the new ovens and everything seems to be in order. All of the unpacking has stopped for now. It's time to give thanks and enjoy the holiday. It is important to focus on the things that really matter. 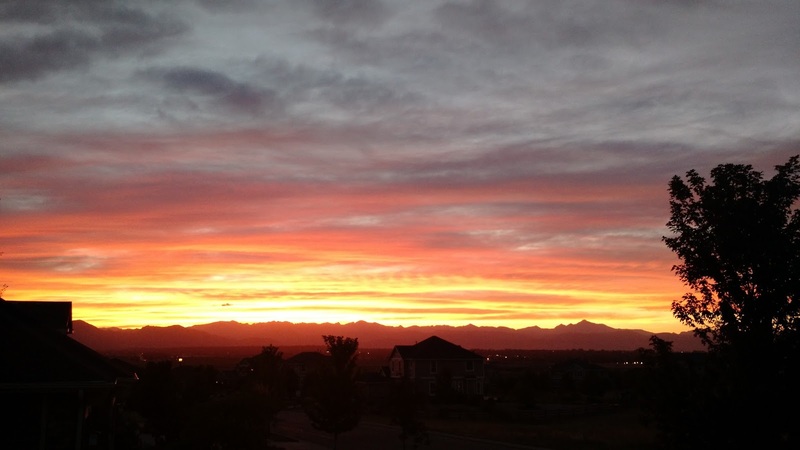 For the past four years we have called Colorado home. We enjoyed the beautiful views of the Rocky Mountains and the fairly mild weather at 6,000 feet. Mr. Collector accepted a job transfer in September and I've been the trailing spouse working on the move. Since September life has felt like camping. We had stagers, appraisers, inspectors, Realtors and the prospective buyers traipsing through our home on a daily basis. We bought a wonderful new home in Minneapolis in October and sold the Colorado house. Fast forward to today - the packers have started. We are usually a three day pack and two day load. It's a 51 foot semi trailer in front of the house that will drive the household to Minnesota. This is somewhere around move number 8 for us. We have had good and very bad experiences with movers. Our worst was the theft of the majority of our household goods from the trailer while it was in transit. Fortunately we have always been good 'documenters'. We had a full household inventory including photos. The claim was still a lot of work and we don't want to ever go through that again. We are hoping for a better experience this time! Wish us luck, my next post should be from the new house later in November! I hope to share photos of my new studio and quilt storage space. I recently had the pleasure of presenting one of my trunk shows, lecture and back basting appliqué class to the Pine Tree Quilters in Wausau, Wisconsin. Tuesday night was the lecture and trunk show, Wednesday morning was the workshop. I passed roads with names like, "Dutch Corners". I am so grateful for opportunities like this. At the appliqué workshop I had 20 enthusiastic students. Again, I apologize for the lack photos, they were such a fun group! Joan finished her project, adding a border of her choice. You can also read more about the visit HERE. Thank you Pine Tree Quilt Guild for your hospitality and enthusiasm! I would love to visit your guild or quilt group. Visit our pattern shop HERE. I have not been very active blogging lately. I have been busy on the quilt front! The "Illuminated Stars" are back from their trip to Maine. See more about the special exhibit HERE. They did a great job on the exhibit - I hope we get to see more like it. 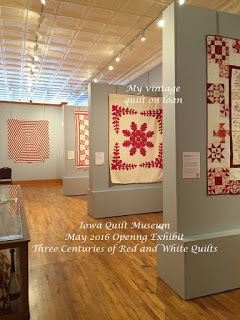 The Red and White quilts will be home from the Iowa Quilt Museum in September. See more about the exhibit HERE. I hope to visit their next exhibit with a star theme. email me if you are interested in meeting there in early November. I'm thinking of adding on Kalona as well. It has been years since I visited Kalona - long over due. For more information on the Iowa Quilt Museum click HERE. 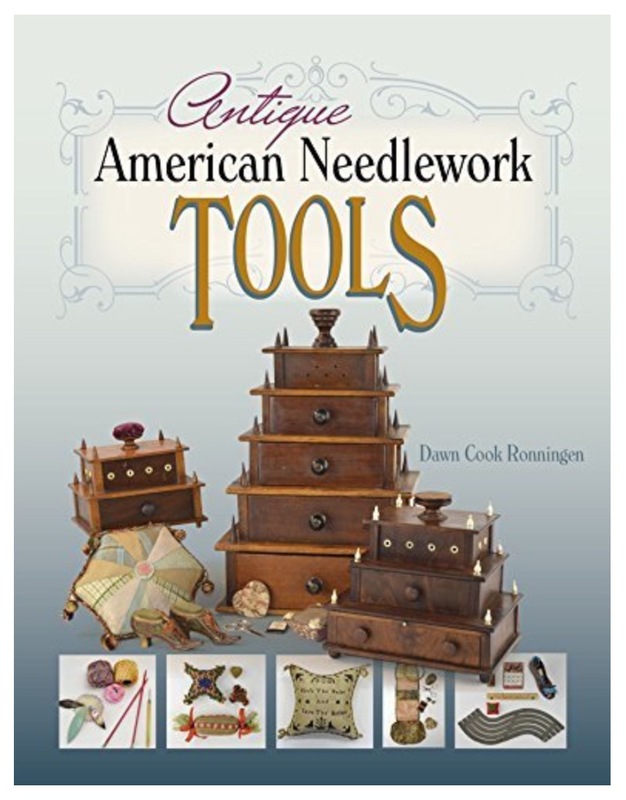 In September I will be in Arizona for the American Quilt Study Group annual seminar. I am looking forward to the study centers, tours, shopping and countless other quilt study opportunities. I am bringing quilts for the bed turning event opening night. There are several "turning stations" - I am one of the moderators for the Pennsylvania Quilts station. I will get a break to see the pre-1850 and doll/crib quilt stations. Thank you to all who volunteer at these events! There are other stations, but those are my priorities. If you are going, please stop by and say hello. This year at seminar is the exhibit for the basket study. I will have a quilt on exhibit there as well. Part of the guidelines prohibit me from showing it to you yet. There will be 50 quilts hanging in this exhibit. 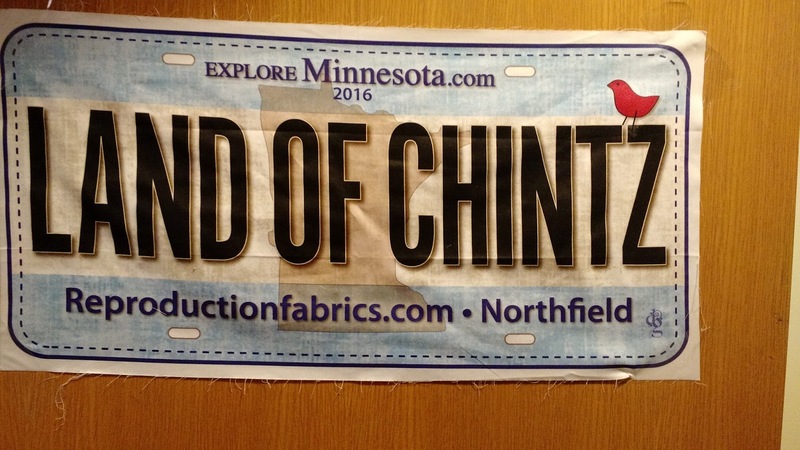 Also this fall, I have several upcoming trips to Minnesota and Wisconsin. I am honored to be speaking and teaching at The Pine Tree Quilters Guild October 11/12. Contact me if you are interested in a trunk show, lecture or class for your guild, small group or individual lessons. In between all the fun we have new patterns coming up! Linking up with the mid month post of the Shenandoah Valley Botanical Album Quilt sew along. HERE. I decided to make my block the crossed stems in the style of the pineapple blocks. The split pink and green in the center of the flower head is interesting. I used three green prints, a solid yellow and a double pink. Thanks for checking in, I hope you are enjoying some stitching time. This is Rosebud on her metal bed with a couple of vintage doll quilts. She is 6.5" tall. The bed is metal with the original paint. I bought it vintage in about 1989. The kids had years of enjoyment with the bed and it was easy to pack so I kept it. The doll quilts are also vintage. Simple shapes, squares and triangles. The bottom quilt is tied in multi colored threads. I am looking for another English Rosebud Doll in the 'thumb sucker' baby style. (UPDATE FOUND). It is for a gift, and has to be the english original. Original packaging isn't needed. The dolls are circa 1950's. Of course, a doll gift will need a doll quilt in vintage fabrics! This post is dedicated to the extraordinary work of Florence McConnell. In addition to making quilts, Florence is a quilt historian and collector from California. The first reproduction quilt is one of my all time favorites! Imagine my delight when I was able to meet the maker and see more of her work. 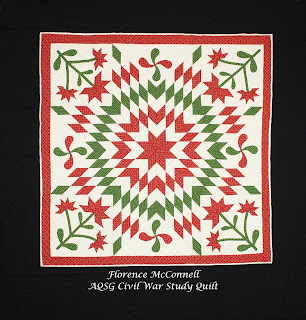 Florence made this quilt for the American Quilt Study Group (AQSG) 19th Century Star Study. The original quilt is in the collection of the New England Quilt Museum. Photos, history and the pattern can be found in the book, "Stars! A Study of 19th Century Star Quilts" by the American Quilt Study Group. Kansas City Star Books. You will want to read about the connection to Lizzie Borden! Florence made this doll quilt for fun, using some of her favorite reproduction fabrics. The design show cases the border prints. The Chintz Stars reproduction quilt also showcases reproduction prints from early 19th century textiles. 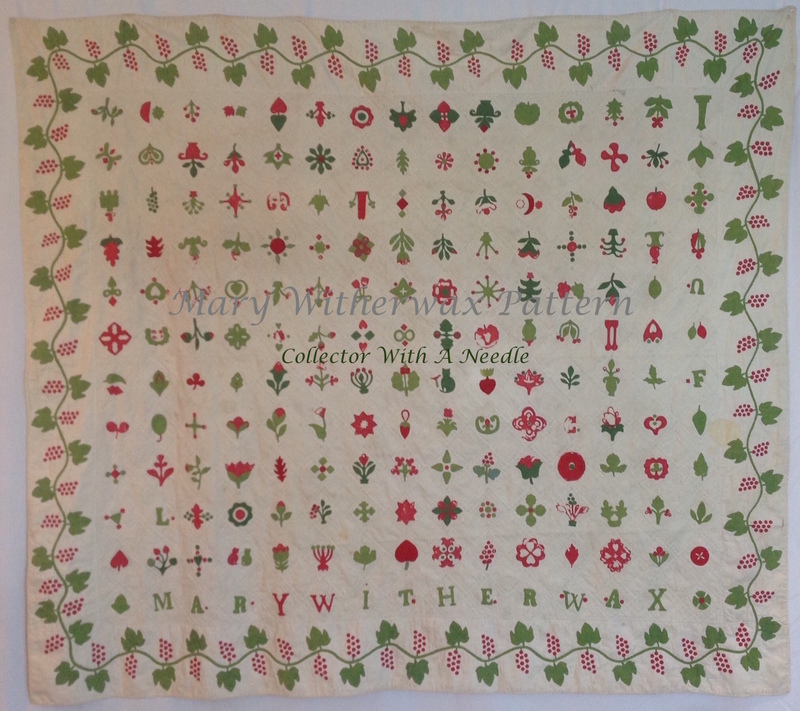 Over 60 reproduction prints were used in this quilt. Notice the setting triangles on the left edge - inspired by an antique quilt. The Calico and Chintz book, puts the original at c.1830. The Irish Bear Paw Puzzle was recreated with permission from Stella Rubin HERE. Florence used it for her AQSG Colonial Revival quilt study project. The quilt is machine pieced and hand quilted. Read the history of the pattern and see this quilt in the book, "Revival! A study of Early 20th Century Colonial Revival Quilts" by Kansas City Star books. The book includes the pattern for this quilt. The entire quilt is so striking - the setting and and edge treatment! 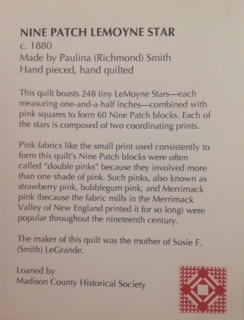 For the 2015 AQSG Civil War Quilt Study, Florence chose a Peony Appliqué Crib Quilt (with written permission) from the New England Quilt Museum collection. (#1999.10). "In War Time: A Study of Civil War Era Quilts 1850-1865". One of a pair, you will enjoy reading about the quilt. 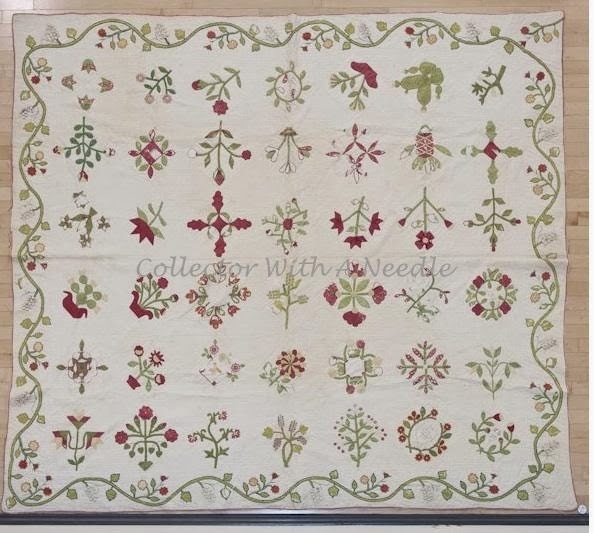 If you are going to "Maine Quilts" - Augusta, Maine to the Pine Tree Quilters Show July 29-31, Florence has two quits in the exhibit, "Little Quilts From Antique Inspirations". She sent her full size original and her small reproduction for the exhibit. The little quilt is machine pieced and hand quilted. I would love to see this exhibit but cannot, so if you go, please share photos. Florence has a quilt from her childhood. It was made by her grandmother in the 1950's. Made in a small size for a child at 33" x 55". Florence remembers as a child thinking it was a huge quilt. It is tied and has a thin blanket for filling. Florence didn't see her grandmother often, she lived far away. Perhaps the quilt was a way to wrap some long distance love around a grandchild. 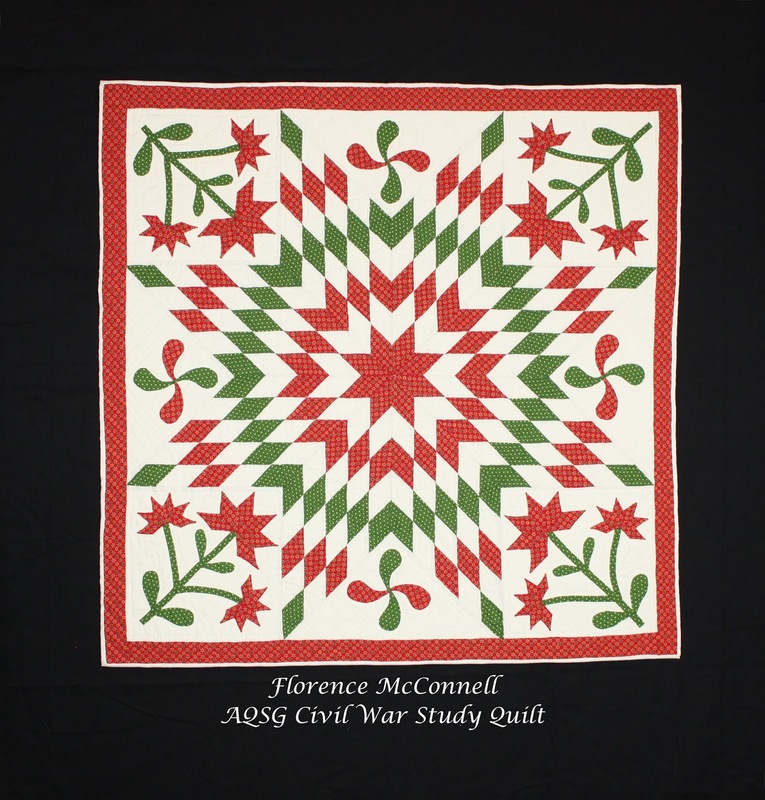 Attendees of the 2016 AQSG Seminar will see some of Florence's antique quilts. 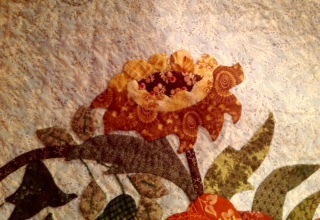 The 15th of the month is link up time for the Shenandoah Valley Botanical Album Quilt. Be sure and check the project blog HERE. Also the Facebook Page HERE. Besides all of the wonderful show and tell, we have some exciting announcements coming up. If you would like photos of your project posted on the blog or Facebook, feel free to email them to me and I can post them for you. If you are a blogger and need help linking up - I can help with that as well. Enjoy your 4th of July. to celebrate the July 4th holiday. the 4th holiday of not. 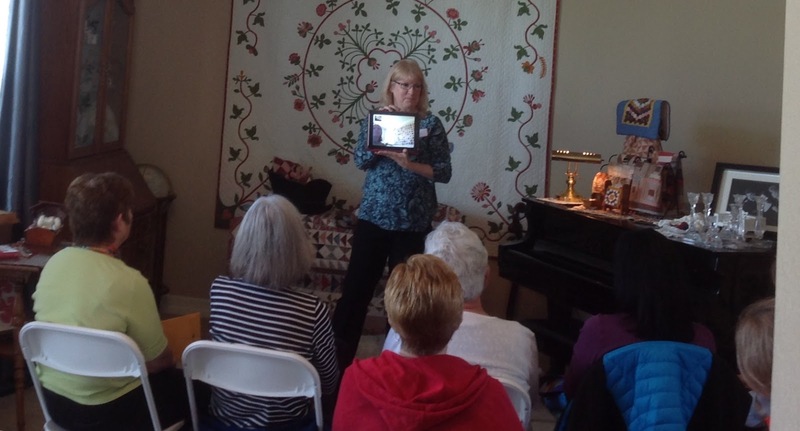 In our May travels, we also made arrangements for a private presentation from collector, historian and author Ann Hermes. You can visit Ann's blog, Notes From The Quilt Lab - HERE. Ann has a world class collection of antique American doll and crib quilts, doll and children's dresses and well as treasured accessories like cradles and cupboards. I had been to Ann's lecture and presentation at the Temecula Quilt Company a few years ago. It was a packed room at that event. Arranging our own event, we were spoiled to have Ann to ourselves. We opted for the doll quilt trunk show. 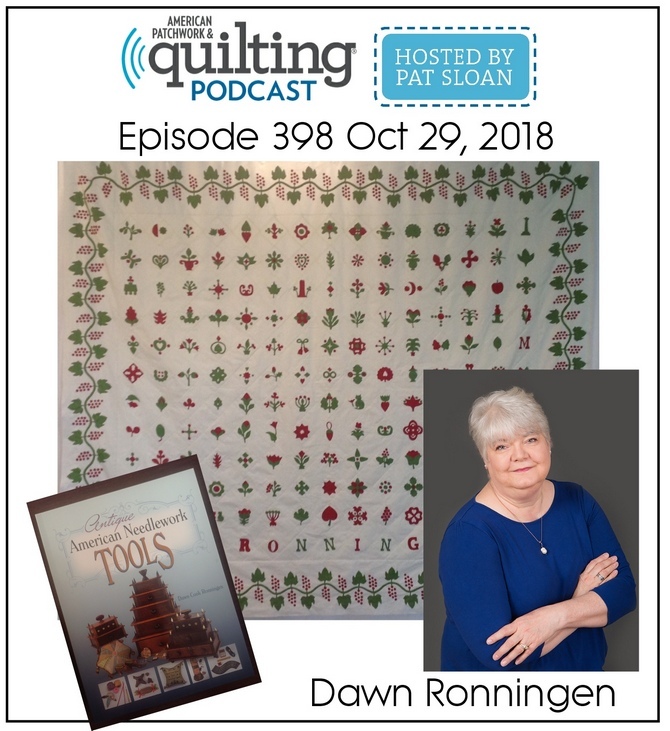 Ann's patterns for some of her little quilts have been published in American Patchwork and Quilting, Fons and Porter's Love of Quilting and Quiltmania. 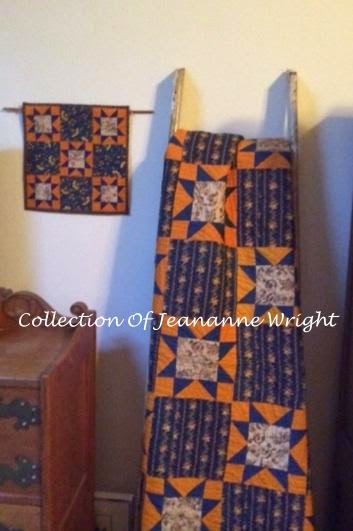 Her book, "Pennsylvania Patchwork Pillowcases and Other Small Treasures" is available in her Easy shop along with some of her reproduction doll quilts and antique finds. HERE. It was a wonderful, inspiring time - we enjoyed every minute. Our only question - When's the next book coming out? There was additional show and tell at my house during the May Event. Shona brought her finished Catherine's Garden BOM quilt. She used Moda Mustard yellow ground fabric, with reproduction prints. Her quilt is beautifully hand appliquéd and hand quilted. In this photo, you can see the medallion setting of Catherine's Garden on the wall. Both quilts are patterned from an 1855 quilt in our collection. Great work Shona - It is a beautiful quilt! Thank you to everyone who was part of my May 2016 - It was a very special month! I love sunflowers, they are such bright and happy flowers. 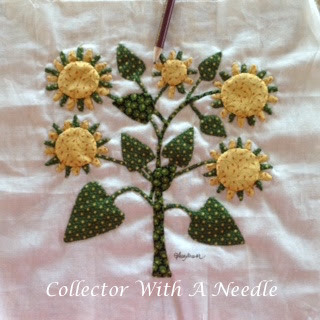 This is my sunflower block for the Shenandoah Valley Botanical Album Quilt. There are so many lovely SVBAQs in the works. I am in awe at the variety of beautiful fabric combinations and sizes. I opted to do the petals with a single circle of fabric. First the green appliqué. I cut out the center of the green out to reduce bulk, leaving the ground fabric uncut. Next, I basted the yellow over the finished green petals. This reduces the chance of the darker green fabric showing through the final yellow center. All one yellow fabric, you can see a variety HERE. I used at least six prints in the sunflower petals. The MoM quilt was started in 2007, also a group project where we all chose our own fabrics. I did this project using freezer paper on top. I now back baste all of my appliqué. Sunflowers remind me of road trips through the Midwest with acres of sunflower heads sparkling in the sun. When the kids were little we planted sunflowers in a circle. When they reached full height we tied them at the top to create a tipi. 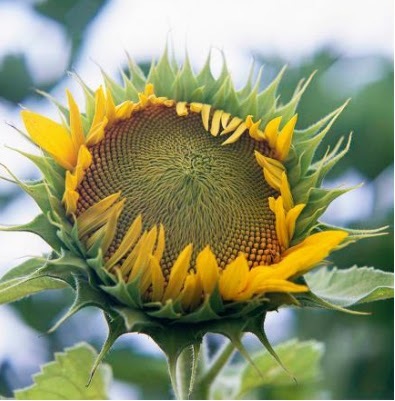 Do you have a sunflower block? Quilt? Garden? Please take a minute and share by leaving a comment. Please join us, you can order your pattern HERE. In my last post, I left off with the Winterthur Museum visit. This display shows layers of bedding on a four post rope bed. The rope is threaded through the wood frame of the bed. On top of the rope is a straw 'mattress'. The next layer on top of the straw is a feather filled mattress. Under the bed is chamber pot for night time personal needs. There was a humorous drawing on the wall done by one of the DuPont daughters showing the awful mess a used chamber pot can make if one trips over it in the dark. The bed hangings are reproductions used to show how the frame over the bed was used. At Winterthur, the DuPont family had their textiles in each room changed out to frame and compliment what was happening in the gardens. After a day home, I welcomed a group of quilters from Virginia. We went out to dinner and gathered at my house the next day. You can read more about it on Doreen and Kyle's blogs, HERE and HERE. It was a wonderful day filled with new friendships, special quilts and lots of fun. We even had a participant Skype in with the fun. The following day the girls did some touring around the area. I've heard the local economy had a nice spike! In the afternoon I arranged for collector and historian Kathy Kenny to give our group a presentation. She has several lectures to choose from and owns many fabulous antique quilts. She held us captivated as she showed quilt after wonderful quilt. 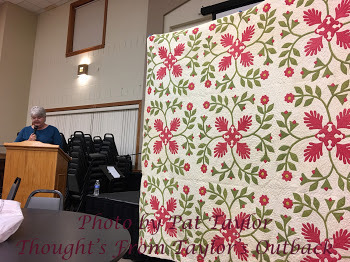 In April I attended her lecture on Women's Suffrage and quilts of that era. 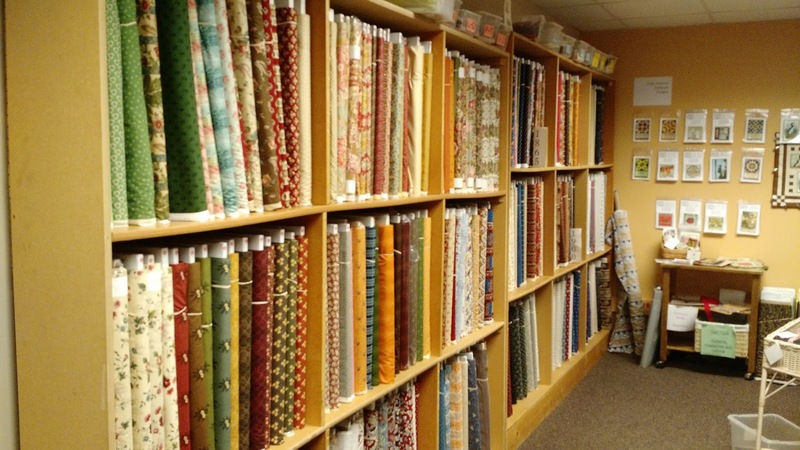 She has attracted the attention of non quilters like book clubs with her detailed research. Did I mention we ate out...some...I have no idea why restaurants would think a large group of quilters would talk and laugh (make a little noise) ?? The week passed all too fast. of May brought to me. They are memories I will always treasure.